Dr David Dibosa, Course Leader of Chelsea’s MA Curating and Collections and Research Fellow for the TrAIN Research Centre, has joined the BBC’s Big Painting Challenge television programme as one of the three judges. The first episode aired last night on BBC One at 6pm. The programme brings together ten artists who, over the course of six episodes described by the BBC as “an intensive… artistic boot camp”, will tackle different genres of painting with their own styles and creative approaches under the watchful eyes of mentors Pascal Anson and Diana Ali. Their final pieces are then exhibited to the public and appraised by David and his two fellow judges Daphne Todd OBE and Lachlan Goudie. Following this, the trio then make the difficult decision to send one contestant home while the others proceed to the to the next stage with the hope of eventually being crowned the overall champion. 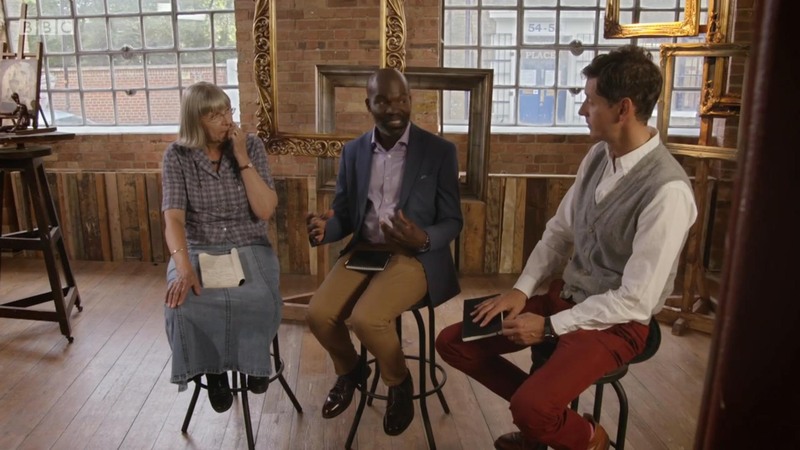 David Dibosa (centre) appears with fellow judges Daphne Todd OBE (left) and Lachlan Goudie (right) on BBC One’s Big Painting Challenge on Sunday 12 February 2017. Presented by Mariella Frostrup and The Reverend Richard Coles, the programme is in its second series. The introduction of David as a judge is not the only change made since the first series was aired in 2015: the ten contestants are this time mentored in groups of five by practicing artists and educators in a structure which aims to echo the atelier system. This gives each of the contestants the opportunity to receive guidance and advice as they approach their tasks and to develop their skills. “It was very different. At UAL, we work closely with our students over a long period of time to develop their talents. This often takes years. In all that time they have access to all UAL workshops to try out different techniques – but the contestants had just three hours and we had just moments to judge. It’s a sprint rather than a marathon. 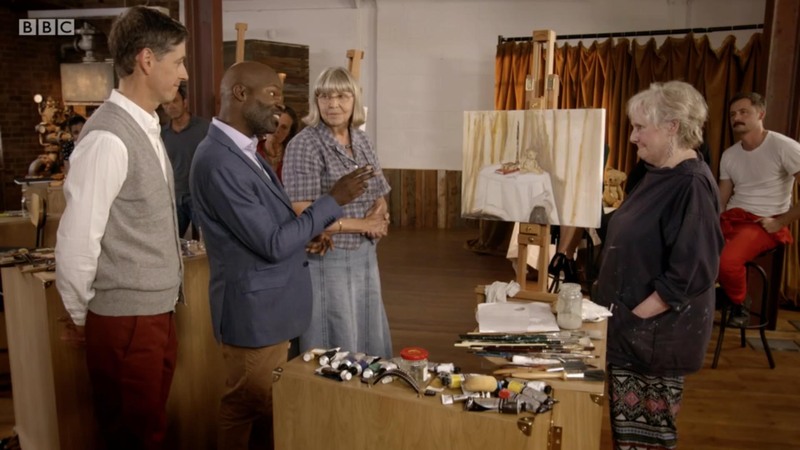 David Dibosa (second from left) reflects on a contestant’s work on BBC One’s Big Painting Challenge on Sunday 12 February 2017. The next episode of the Big Painting Challenge is on BBC One on Sunday 19 February at 6pm. Watch the first episode on iPlayer. View Dr David Dibosa’s research profile. Find out about MA Curating and Collections on the course page.